Interior: Built as standard Greenwood race car to fit IMSA and SCCA regulations. All the cars built in this series, whether team cars or cars sold to customers, were built on new GM-style frames, with Greenwood's modifications and strengthening. I think that all three �team� coil-over cars may have been acid dipped. The Mancuso (and other) customer cars were probably not lightened to the same degree since they were "series built� to customer orders. There are other similarities amongst all cars in the customer car series. The roll cages extended beyond the front suspension mounting points to the front of the chassis. Front suspensions were standard GM A-arm style with springs and shocks mounted as separate units. Of course, Greenwood always used the Koni double-adjustable shocks and the needle-bearing bushings. Actual customer cars could be built with either conventional "trailing arm" and leaf spring or "coil-over" (rear-only) suspensions, depending on the series they were intended to enter. Some of the rear "coil-over" cars even have a vestigial transverse leaf spring to meet specific series rules which required stock suspension configuration but also allowed supplemental springs. About the only thing that is not original on this car is the dash. John built the cars with the panels for buttons and switches "under-dash" but Kerry pulled that out and put in a panel box on the passenger side floor to keep his knees from hitting them. Kerry Hitt had changed this part of the car to meet his own needs. Notes/Race History: The car is chassis #007 in Greenwood's customer car series. It was built for Rick Mancuso, who ran Lake Forest Sports Cars in Lake Forest (IL). It was early in 1975 when he bought the car from Greenwood. As with most of the customer cars, the chassis was a basic GM-style frame with coil-over rear suspension and standard-style front suspension. A lot of the body pieces look like they came off a 1973 or that era. Rick raced it for a few years and then sold it to Gary ??. The car was driven by Tom States as # 8. Then sold to Kerry Hitt, in Pennsylvania. 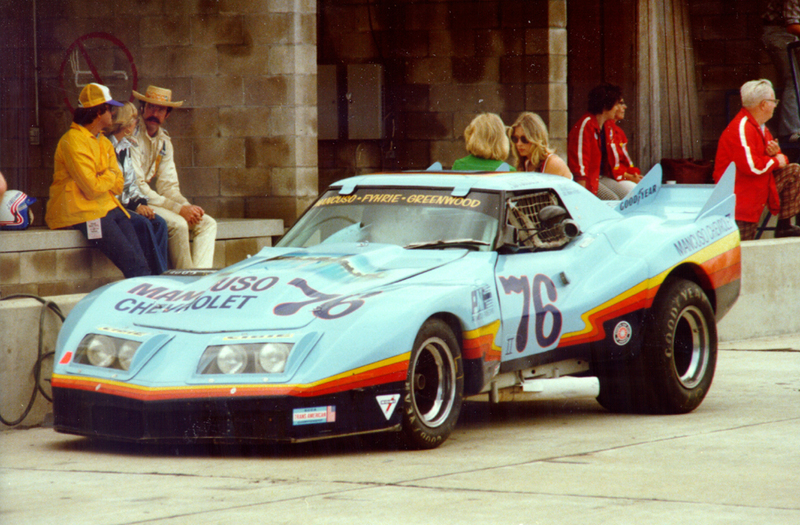 Kerry ran in the SCCA's Trans-Am series as car # 27. When he finished with the car, it went to Paul Canary. From there it went to George Neuse, and so on. The story about how the car got to Le Mans is also pretty interesting. I guess John Greenwood was about the only car owner ever to be paid to bring his car to Le Mans. In 1976 there was the fuel crisis and not many cars were signed-up. This was affecting projected attendance so the organiser, who had helped John in 1973, called him up and offered him an appearance fee if he would bring some of that raucous North American iron. John's cars were always a bit hit with their big blocks and flag motif. There are a few interesting stats on the Le Mans car but, unfortunately, there was not a whole lot of press coverage in the US. Also, because the car was a late entry, there is not much in the official program about it. One fact that everyone agrees is that it did a 215.6 down the Le Mans straight. That engine was a Gary Smith (Carolina Racing Engines) product. It qualified 8th on the grid but did not finish. The magazines of the day reported that the car experienced damage to the fuel cell and that caused its withdrawal from the race. Copyright © 2007, Registry of Corvette Race Cars, all rights reserved.